For his appearance, Johnny Depp was no flamboyant Jack Sparrow, although he was far less reticent than his usual interview appearances. Raging Bull Robert DeNiro was downright shy; bombastic Al Pacino was all but tongue-tied, passionate Sean Penn was uncharacteristically reserved and bad boy Russell Crowe a tamed teddy bear when I watched their interviews in the Leading Men collection. 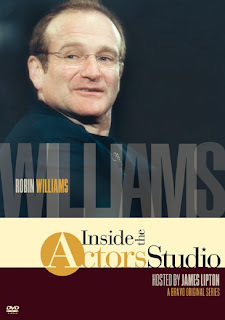 So what to expect of Inside the Actor's Studio with Robin Williams? A pensive, thoughtful side to the exuberant persona we've come to know? A Pagliacci revealed? The quieter, solemn side of the man we knew as Mork? From the moment Robin Williams is introduced and steps out onto the stage, his manic antics take over the show. As described by the Ubermeister of Unctuousness, an interview with Robin Williams is like catching lightning in a bottle. Actually, Mr. Melodrama said it was like "catching lightning with a butterfly net" but me thinks Monsieur Lipton is mixing his metaphors. The interview session lasted FIVE hours (Can you imagine? My @$$ hurts just THINKING about it!) --most of which was Williams riffing off of anything and everything-- and was edited into a two-hour special. Williams does settle down and gives thoughtful and coherent answers to the student questions at the end, but the bulk of the program proves that it's Robin Williams world--and the rest of us are just an audience for it. Some of his bits are inspired, some fall flat--but all of them whip past in the frenzied stream of consciousness that is Williams' trademark. "Legalized insanity" is what he calls it. For me, a little Robin goes a long way, but there's still a lot of good stuff in these two hours and tons in the deleted scenes that didn't make the cut. If you're a Williams fan, you will definitely want to add this to your collection. The Kevin Spacey interview is great. He does terrific impressions. It's not on dvd but you can find it on YouTube. Sometimes these interviews are hit or miss. I watched the two-hour show with Dustin Hoffman and it was good, not great. The best interview of those I've seen on DVD was surprisingly (to me) Russell Crowe. He was very ingratiating. The best interview I've seen--which was the first and only time I've seen the show on TV--was Carol Burnett. She was amazing. Smart, funny and very down to earth. Wow, Russell Crowe, I never would have guessed. You know, a few months ago I watched a documentary with Carol Burnett called Moon over Broadway, about her return to Broadway in a play after a 30-year absence and she came across the same way - smart, funny and down to earth, plus a very hard worker in terms of learning her role and improving her performance. At one point the set breaks down during previews so she gives a little impromptu solo performance while they get it fixed. A real trouper!